Blyth Spartans midfielder Stephen Turnbull is leaving the Northumberland club to take up full-time employment outside of football. The 30-year-old said he is leaving Crof Park with a heavy heart after enjoying three spells in the green and white during his career. Turnbull flies to New Zealand next week to take up a post on a cruise ship. He said: “I love it at Blyth, but I’ve got a job as third officer of the watch on a cruise ship and, on February 10, I’ll be flying out to New Zealand to start the cruise. “I will be back from time to time, but it is largely the end of my football career. “I have to say I was really upset after the game against Matlock. It was my last at Croft Park and I was genuinely upset in the car going home. 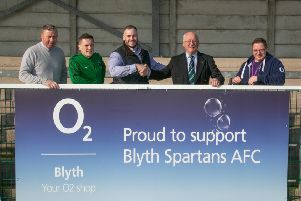 Turnbull’s love for Blyth is apparent whenever he speaks about the club and he revealed just how grateful he is to Spartans for his time at Croft Park. ‘Twinny’, as he is known, added: “I’d like to give massive thanks to the Blyth fans and the board of directors who have given me their continued support over all the spells I’ve had at Croft Park. Blyth is a magnificent club. On Turnbull’s departure, Spartans general manager Ian Evans said: “First of all, may I wish Twinny all the best in his new job. It is a job that he could not turn down and the club fully accept his decision. “Stephen has never given less than 100 per cent in any game and was a joy to watch as he controlled many a game from midfield. A truly classy and committed player.